Greece's Alexis Tsipras refused to call off a referendum on the country's bail-out, after being threatened with imminent financial ruin and a banking collapse as early as Monday if he chooses to press ahead with the vote. During his third televised address in five days, the prime minister railed against the "blackmail" of Greece, insisting he would not cancel the vote and promising that all citizens' bank savings were safe. In the face of creditors' insistence that a 'No' vote would eject Greece from the eurozone, Mr Tsipras said it would be a "decisive step towards a better agreement that we aim to sign right after Sunday's result". In chaotic scenes in Athens, hundreds of pensioners besieged banks in an attempt to withdraw their pensions. The decision to hold a popular vote has caused a major split between France and Germany over whether to make a deal with Greece ahead of Sunday's referendum. Francois Hollande said waiting until after Sunday's referendum is a "leap into the void", but Angela Merkel, the German Chancellor, repeated that there could be "no negotiations" on a new deal until Greece has voted - an event likely to force Mr Tsipras from office if voters back the austerity package. The eurozone's most powerful leaders yesterday appeared to reject a bombshell letter from Greek Prime Minister Alexis Tsipras, in which he offered to accept the vast bulk of the austerity demands made by the country's creditors, with only relatively minor changes, in exchange for a new bailout. Stock markets leapt across the Continent when news of the apparent Greek reversal emerged yesterday morning, as expectations shot up that the two sides would do a deal despite everything. 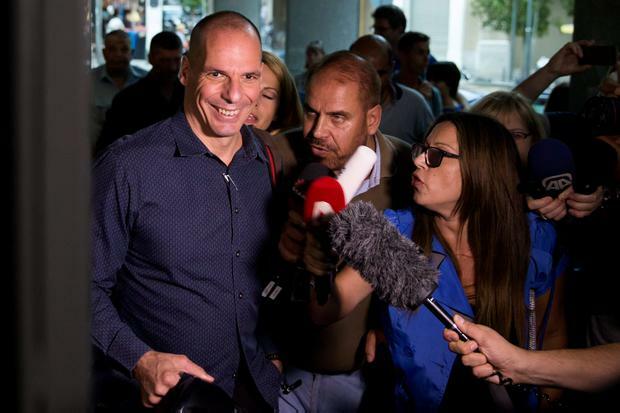 There was even speculation that Mr Tsipras would call off Sunday's plebiscite. Yet those hopes were dashed when the German Chancellor, Angela Merkel, seemed to spurn the olive branch. "Before the referendum, no further talks on an aid programme can take place," she said. That rebuff prompted Mr Tsipras to confirm in a televised address to the Greek public that the referendum would go ahead as planned - and that his government would still urge people to vote "no" to the creditors' demands. "The sirens of destruction are blackmailing you to say yes to everything without any prospect of exiting the crisis," he said. The Eurogroup, made up of eurozone finance ministers, also confirmed last night it would take no action in response to Tsipras's letter until after the vote. "We see no grounds for further talks at this point," said the group's president Jeroen Dijsselbloem. Yet there were signs the letter had opened a divide within creditor nations, with the French President, François Hollande, saying a deal could still be done before the vote. "It is our duty to keep Greece in the eurozone," he said. Many creditors have firmly told Greece's population it will be effectively voting on whether the country will remain in the single currency, or even perhaps the EU. But Mr Tsipras insists that a "no" vote to the creditors austerity demands on Sunday will merely prompt a fresh round of talks with creditors - and that a rejection will strengthen his hand. At 11pm on Tuesday, Greece failed to make a €1.6bn payment due to the International Monetary Fund, one of the country's creditors, becoming the first developed nation to go into "arrears" with the fund. The effective sovereign default has ratcheted up pressure on the ECB to further restrict the funding available to banks, which have been swapping Greek government bonds for funding from the Frankfurt-based central bank. Last night, the ECB decided to maintain the current funding limit. If Greece's banks are cut off entirely from ECB support, the government would likely have no choice but to nationalise banking and print state IOUs to pay its public-sector workers. Analysts expect this would be the first step towards re-introducing the drachma. In his letter, which was sent to the European Commission, the ECB and the IMF just hours before the fund repayment was due, Mr Tsipras said he was prepared to accept most of the demands in exchange for more cash over the next two years. However, he held out for a continued 30pc VAT discount for holiday islands, a slower implementation of pension reforms and delayed cuts to military spending.